Ecocoast has been working with HDPE pile sleeves to protect and extend the lifespan of tubular steel piles for many years. Last year, Ecocoast studied alternate solutions to offer additional longevity, whether they are old and rusting marine piles or new installations. UHMW-PE pile sleeves have been used in the US for over 10 years, and Ecocoast partnered with the manufacturer of these sleeves to carry out the first installation in the Middle East. The sleeves are made from Ultra High Molecular Weight Polyethylene – the toughest plastic in the world. UHMW-PE is highly resistant to corrosive chemicals, has extremely low moisture absorption and a very low coefficient of friction. The material is highly resistant to abrasion, making it an ideal material for use in marine environments. The sleeves are heat-shrunk onto piles to offer additional protection and prevent corrosion. The most common use of the sleeves is on old, rusting piles that are nearing the end of their lifespan, however, they can also be installed on new piles. 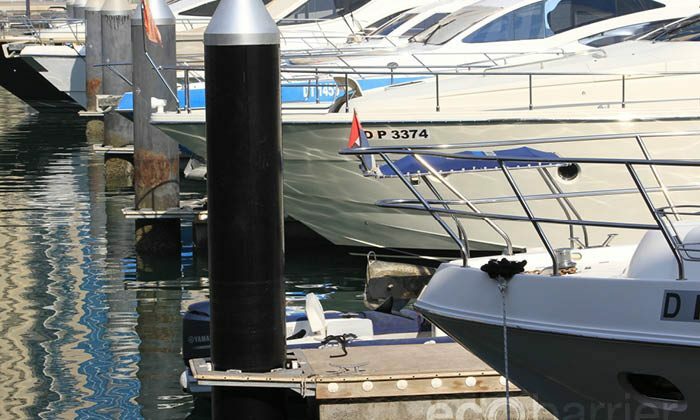 Ecocoast installed UHMW-PE sleeves on two old corroded piles at Dubai Marina Yacht Club last year, in order to have a local example of the finished product, to perfect the installation process and to test their durability in the climate of the region. Prior to the sleeving process, the old piles had to be cleaned of all marine growth. Above water, this is done with a high pressure steam cleaner and below the water using a cavitation cleaner which is faster than the manual process. Following surface cleaning, traces of rust were removed by hand tools and cavities were filled by epoxy putty, making for a smooth surface that would enable the subsequent sleeving process. The sleeves are custom made to suit each pile to ensure the right fit in diameter and length. The custom-made UHMW-PE sleeve was placed around the cleaned pile and then steamed to fit tightly around the pile. By lowering the steaming “jacket” below the water level, the steaming process continued down the pile, along the full length of the sleeve. After cleaning of the piles, the installation process takes about 1 hour per pile using minimal equipment and manpower. After installation, the original rollers or pads need to be replaced with low friction PTFE wear pads designed for the sleeves to prevent damage. The works were carried out on an existing pontoon, and using an additional small floating pontoon. This methodology presents significant savings compared to pile replacement in terms of equipment, material costs, manpower and time. The installed sleeves provide an air tight covering to the pile preventing corrosion in the sleeved area. They also provide additional protection from future wearing of pile rollers and a shiny gloss finish. On a new installation they are expected to increase lifespan of a tubular steel pile by 30-50 years.